In several posts, on this blog, I have mentioned Flora’s work. Flora is the great-granddaughter of Levi Goss an older brother to my 3rd great-grandmother Lydia Goss Spracklin. Flora paved the way on a lot of Goss genealogical and family history research in the early 1900’s to her death in 1951. This was a time when genealogical standards were not well established. It wasn’t till Donald Lines Jacobus came on the scene in the late 1930’s that genealogical methodology began to be formulated. I have read and have a copy of his “Genealogy as Pastime and Profession.” Genealogy Publishing Co., 1968. He believed in cluster genealogy, which is studying the whole family. Now we have Evidence Explained and other resources to help us. Elizabeth Shown Mills a prominent genealogist of today also believes in cluster genealogy; yet she goes further extending it to studying the neighbors, business associates and friends. I have had the great fortune of attending several of her presentations and lectures. Do check out the link to her website because she has published some of her articles. Some researchers have criticized Flora for her methods. I like to think of her work as a road map, giving clues and pointing the way. I admire Flora, but realize that she was not the best typist, nor the best writer. D. Joshua Taylor, of the New England Historical and Genealogical Society, gave a talk at the New England Regional Genealogical Conference (NERGC) in 2011 in Springfield, MA. He talked about the different ages of genealogical research and their focus from 1890. The time period that Flora was living in was very much into hereditary organizations like Mayflower and DAR. The standards were not as stringent as they are today. You may not find many sources given in Flora’s work. Again it was how genealogical research was done and the quality of the source was not questioned. It does not mean we cannot appreciate the hard work and time involved. We can use what Flora accomplished in her research and expand on it and revisit the sources to determine their quality and accuracy. Flora died in 1951 and that means a good 60 years has passed by and the sources she used have been republished and reprinted in new formats. So it can be difficult to find them. Please remember that in the early 1900’s they had typewriters not computers. They had photostatic copies not copiers. It was expensive to make copies. There were no scanners. There were no cameras of the quality like today. We are so lucky to have digital cameras, computers, Ipads and smartphones. I wonder what she would have thought? Many times they would mail a manuscript to a relative and ask for their opinion. The relative would comply and then mail the manuscript back. This is why you don’t see the attachments only the letter, and sometimes you don’t see the reply letter. Writing letters to each other rather than making phone calls were their means of communication. They didn’t have a lot of money. The Great Depression ran from 1929 to about 1945 right smack in the middle of Flora’s life. I wonder what she would have thought about texting? Flora was very much involved in Mayflower and DAR (Daughters of the American Revolution). 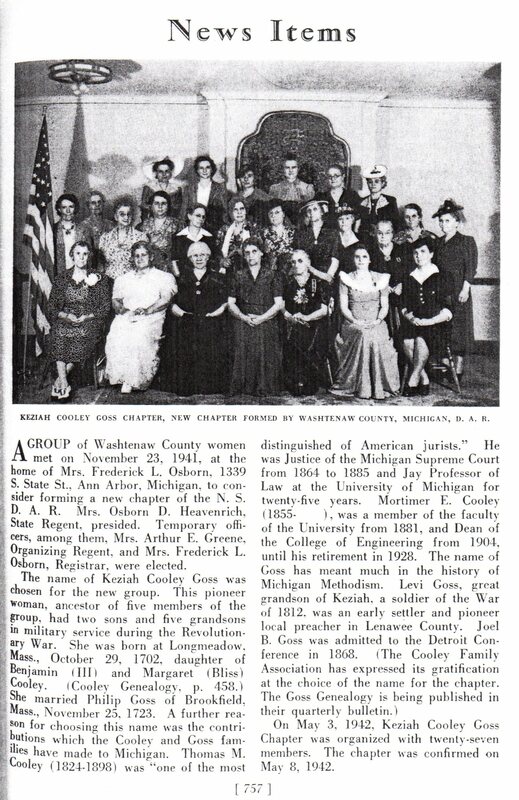 In 1942, she was a founding member of the Keziah Cooley Chapter of the DAR in Ann Arbor, Michigan. She was also its regent and registrar. Unfortunately this DAR chapter was disbanded in 1963, a good 12 year after her death. Based on this article and picture above, can you figure out which one is Flora? All you have to do is click the picture and then use the back button to return. 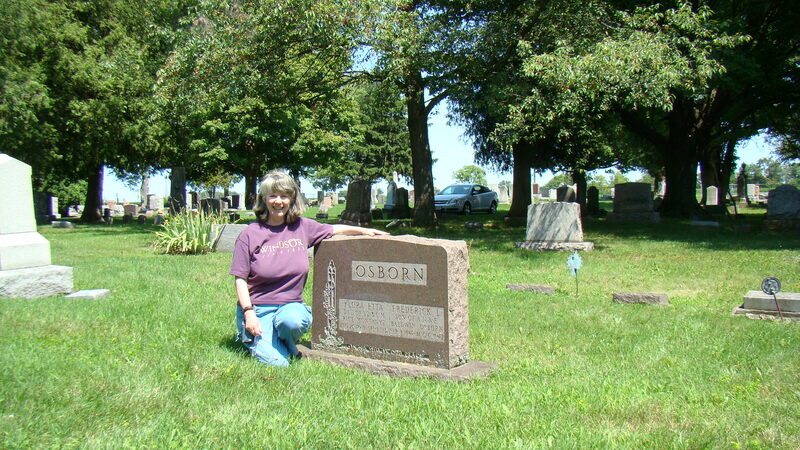 UPDATE 5/26/2013: A photo of Flora Osborn from a descendant of this individual has been shared. 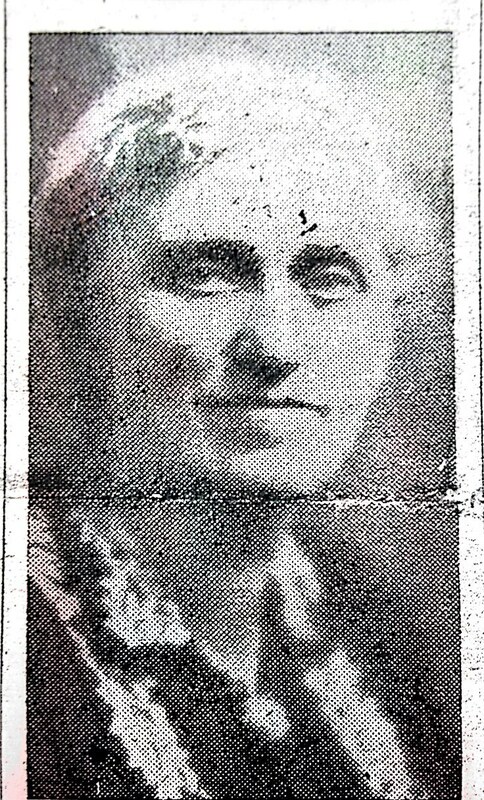 This was taken from a news article in the Washtenaw Newspaper, the article was titled “As a Woman Thinketh, A Story of Success of Mrs. Flora Montanye Osborn, Celery-Cabbage Queen, House-Fancier, Pioneer Irrigator of Michigan and Citizen of Ann Arbor.” This article appears in recent issue of “Farmers’ Wife” Magazine. (page eight), no date given. “…Dinner over, she rose, a tall, spare, impressive figure in a tailor suit, hair just turning grey, live eyes of steely blue; an air of one who was in earnest and could not on any account be turned from a course of action.” The article is quite long and very detailed about her farming. A lot of the research done back in the early 1900’s is being questioned by Mayflower and the DAR. This means the lineages are being revisited to make sure they are correct based on today’s standards. So when you look at the published DAR Patriot Index books (there are many years and publications of this index) realize that is it not used to prove an ancestor but more as a reference and starting point. Also be wary of the DAR Lineage books and use them as a starting point. Ancestry.com has all 152 volumes published in 1923 and 1938. “…I know you are busy, and I don’t see how you do, as you do. You must have worlds of energy. Thank you so much for your help. Signed Mrs. F. Osborn. Flora’s great great grandparents: Solomon Goss (1754 to 1825) and Olive Scott (1757 to bef. 1810) m. 25 June 1776. Flora’s great grandparents: Levi Goss (1793-1872) and Sophia Rummersfield (ca. 1800 to 1856) m. date unknown but probably in northern New York. Flora Etta Montanye (1869 – 1951) and Frederick Lester Osborn (1867 to 1942) m. 23 April 1891. See my posted dated September 9, 2012 on Levi Goss and Sophia Rummerfield Goss’ Family for details about Flora’s lineage from Levi Goss and Sophia. Flora and I are 3rd cousins twice removed. Our common ancestors are Solomon Goss and Olive (Scott) Goss. Solomon and Olive are my 4th great grandparents. Levi Goss is my 3rd great-uncle. DAR Yearbooks: Yearbooks, Keziah Cooley Goss, DAR Chapter, 1943-44 and 1944-1945. FHL#M929.3.M62.W31 Only on film at the FHL #927452 Item 5. In the pages she writes about her Montanye family history. A copy can be found in the DAR Library in Washington D.C. or through the Family History Library in Salt Lake City. 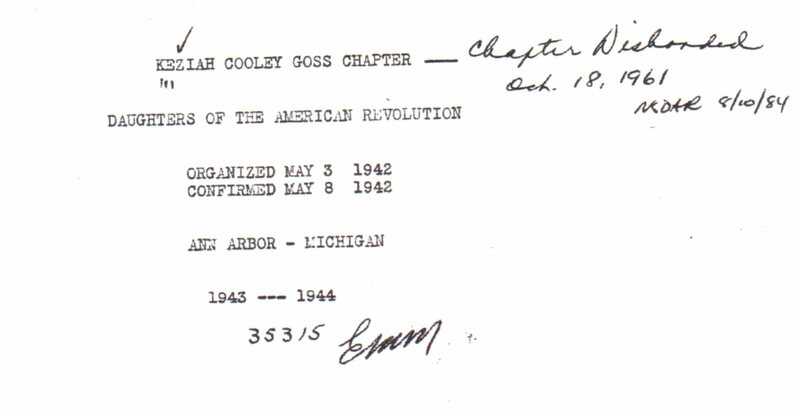 1944-45 Year Book of the Keziah Cooley Goss Chapter D.A.R., Ann Arbor Michigan – Flora Montaye Osborn, 1st Registrat, Vice Regent, now Registrar. Contributed Genealogy by (Mrs. F.) Flora Montanye Osborn. Starting in 1657 with a Dr. John de La Montagne to her father Sidney Montanye on pg. 22. 1943-44 Year Book pg. 2 to 7 Goss Family by Mrs. Flora Montanye Osborn and others. Includes the Josephus Rice bible Record. The Goss Family starts with Philip Goss (1664) and goes through to Solomon Goss (1754 to 1825). The Year Book contains other genealogies that Flora assisted members with preparing. It also gives a brief history of this D.A.R. Chapter. There is a photograph in which Flora appears but the copy is very bad. You will have to seek the original for a better photograph of the chapter members as I featured above. Osborn, Flora Montanye, “Additions to the Cooley Genealogy, The Detroit Society for Genealogical Research Magazine, Vol. VII, No. 1, Sept-Oct. 1943, pg. 25-26, Detroit Society for Genealogical Research, Inc., Burton Historical Collection. NOTE: There is the Detroit Library Burton Historical Collection and the Detroit Society for Genealogical Research. I happened to get my copy from the library. If you are near a large library they may have the actual magazine, like the Seattle Public Library does on the 9th floor. The book mentioned above “The Cooley Genealogy” has been a cornerstone of the Cooley Genealogy is the one done by Dean Mortimer E. Cooley, “The Cooley Genealogy, The Descendants of Ensign Benjamin Cooley,” (Rutland, Vermont, The Tuttle Publishing Co., Inc., First published 1941, Reprint Ed. 1988), Seattle Genealogical Society, Seattle, WA or on-line at Heritage Quest. 2. This is research done by a Robert McCargar, “Summary of Letters, Family Histories” by McCargar, Campus Martius in Marietta. Family History Film#940938 Items 4-5, circa 1973. Contains another copy of Flora’s “Goss Family.” I traveled to Marietta and visited Campus Martius and was unable to determine if they are still a research facility. I got the feeling that the information was housed at the Marietta College, Special Collections. 3. Collaboration with Paul on articles. Flora collaborated with Paul H. Goss on several articles exchanging research, constructive criticism and family news in letters over the years. Here are a few. As I feature these letters in posts on this blog, I will point the way to the transcription of the letter for you to review. a. To Paul Goss, February 3, 1941 from Mrs. F. Osborn. They must have just met because her Flora is using a more formal signature. This letter is an example of their collaboration on the “Goss Family History.” In this letter Paul gives her some edits for the work. There is no copy attached however. This letter will fit best with a discussion about Philip and Mary Goss. Flora encouraged Paul H. Goss to apply to Mayflower. He was having to prove the Goss lineage. She wrote encouraging words and also took action herself to assist him. Unfortunately, Flora died in September of 1951. Paul entered Mayflower in June of 1951. I hope she knew that Paul was accepted before her death. DAR Applications: It was not until I visited the DAR Library the 2nd time that I finally figured out why Flora was not showing up under Philip Goss in the DAR Applications. She came in under Caleb Rice on her mother Charlotte Rice’s side of the family and later submitted a supplemental application under Philip Goss. Years later she assisted her daughter and granddaughter into DAR through the Philip Goss line. Flora Montanye Osborn: Aplication for Membership to the National Society of DAR, Flora Montanye Osborn #327782, Patriot: Caleb Rice, accepted June 4, 1941. Supplemental of Flora under Philip Goss: Application for Membership Supplemental Line, Revolutionary War Member Philip Goss #327782. Etta May Osborn Bebout, #332007, Ancestor #A046414 under Goss. Granddaughter Barbara June Bebout – Application for Membership in the National Society of the DAR for Barbara June Bebout, Ann Arbor, Michigan #337400. The DAR will charge you $15.00 for each application you order whether you are using the index online or are actually at the DAR headquarters in Washington D.C in their Computer Room. They have placed many of the applications online and you can search the indexes at the DAR Website. See the sidebar of this blog Favorite Links – New England and click the link to the DAR website. Mayflower Applications: Flora’s Mayflower Application was not available to me when I visited the Mayflower Library in Plymouth, MA (2003). They did try to find it for me. Instead of her application I did come away with another through Lydia Spracklin Ross’s grandson Max McVay. When they handed it to me I hollered in instant recognition because I had learned of this man’s research when I visited my cousin Bertha in Miles City, MT. Max died in 1996. Jan-Feb 1949 – In the Notes of the Society on the last page it reads … Mrs. Osborn and party from Ann Arbor. I also found this tribute to Flora in the actual Detroit Society for Genealogical Research Magazine, Vol. IV, October 1951, Number 1, pg 2. Seattle Public Library, Seattle, WA. Flora’s death is mentioned in the Washtenaw Impressions newsletter published by the Washtenaw Historical Society, Ann Arbor, MI Vol. IX, No. 3, March 1952, pg. 6 under Eight Losses By Death – Deeply felt by the Society as real losses. Here is Flora’s tombstone which I visited on the same trip I mentioned above. See the posted dated November 4, 2012 – Rice Cemetery, Monroe Co., Michigan for more details. I do have two wishes. To find out what happened to her genealogical notes and to obtain a picture of her and her husband. Thank you Flora, you are most appreciated. Flora was my great great grandmother. Have photos of her that I will be glad to send you.  I am looking for information, a cemetery plot, for Flora grandson who died in a fire at 10 months old. His name was Lewis f. Osborn. Hello: Lisa. I am so very very glad to hear from you. I was worried that the family may have died out for Flora, but this great news. I have studied all my cemetery records and my photos but I do not see the son’s name. I tried Find A Grave and they don’t have the child either. You might have to contact the Rice Cemetery office and inquire in their records if they have the burial. I got my information before I went for my visit to the cemetery by contacting the Genealogical society. Did you see my post on the Rice Cemetery visit. I do have more photos and I would love to see your great great grandmother’s face and eyes. I am happy to share with you what I have. I will contact you directly.